Norman Borlaug was an agronomist* who devoted his life to finding a way to feed starving people of the world. He has been called the father of the "Green Revolution". He was born in 1914 on a farm in Iowa. In high school he was active in athletics, participating in football, baseball, and wrestling. His grandfather urged him to go to college after he finished high school. He attended the University of Minnesota and studied forestry. After graduation he went to work for the U.S. Forestry Service. 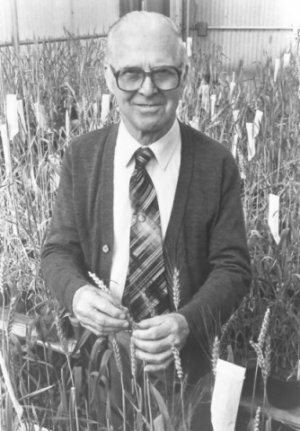 After hearing Professor Elvin C. Stakman at the University of Minnesota speak about plant diseases, Borlaug talked with him about pursuing an advanced degree in plant pathology. * He returned to school and got a masters degree and a doctorate in that field. Then he worked for a couple of years as a researcher for Du Pont. A turning point in his career came when he accepted an appointment by the Rockefeller Foundation to work with the Mexican government improving the crops in Mexico. The wheat they were growing did not produce much grain and the tall stalks would fall over before they could be harvested. Through experimentation he was able to develop a dwarf wheat which was shorter and would not fall to the ground. This new wheat also made larger heads of wheat with triple the number of grains in each head. Farmers could produce a much larger crop of wheat on the same ground they had been farming. This variety of wheat was also not subject to disease that had plagued their crops before. It was a remarkable improvement! 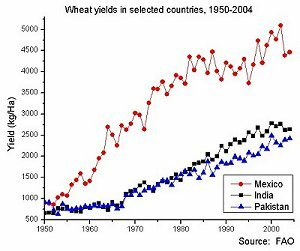 They took this new wheat seed to India and Pakistan where there was a famine. People were starving to death. When the seed was planted in these countries they had similar results; a great increase in the amount of food the people were able to produce. There was more food for them to eat and more children were able to thrive and grow. He also developed a new grain called triticale* which was part wheat and part rye. It produced a nutritious grain larger than wheat which could feed masses of people. In order to spread this knowledge, Borlaug trained young scientists in many countries to carry on the work. He went into the fields with them and showed them the best methods for growing the grain. When people are able to plant high-yield grain crops, they can feed themselves using fewer acres of land. This helps to prevent more deforestation. * Instead of cutting down trees to make more farmland, they can grow a crop on the fewer acres they already have in production. The "slash-and-burn"* method where people cut down the forests has caused more soil erosion. Valuable land is washed into the sea, and sometimes windstorms carry the topsoil away. The loss of trees also affects the quality of the air we breathe. 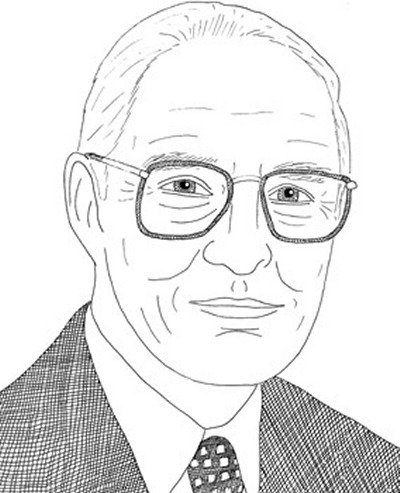 Some environmentalists* have opposed Borlaug's methods and have tried to stop his work. They protest that using fertilizer is bad, though it only replaces the soil nutrients that have been depleted. Others are sure that bioengineered* food is toxic to people and will make them ill. They think people should continue using the same seed they have used for years. The new strains continue to grow wheat and rye for making bread, and these new varieties will produce even more grain than the old variety, and the shorter stalks will stand up until harvest. Studies (of this type) have established that the level of safety to consumers of current genetically engineered foods is likely to be equivalent to that of traditional foods. At present, no verifiable evidence of adverse health effects of BD foods has been reported, although the current passive reporting system probably would not detect minor or rare adverse effects or a moderate increase in effects with a high background incidence such as diarrhea. Roger Thurow, author of Enough: Why the World's Poorest Starve in an Age of Plenty notes that Africa was left out of the "Green Revolution" and as a result millions of Ethiopians face starvation just as they did 25 years ago. Norman Borlaug taught and researched at Texas A and M University from 1984 until his death in 2009. During his life he received many honors for his work, and in 1970 was awarded the Nobel Peace Prize. In 1977 he received the Presidential Medal of Freedom for his humanitarian contribution, and in 2007 he was awarded The Congressional Gold Medal. This biography by Patsy Stevens, a retired teacher, was written in 2009. Norman Borlaug's address at the Nobel Centennial Symposia, held on December 6, 2001 in Oslo, Norway. Press "Go" to find the book "The Boy Who Changed the World", the story of Norman Borlaug. Thank you for posting information about this great man. I'd just like to point out a typographical error on one of the graphs. You note that 1 kilogram is equal to 22 pounds. It is actually equal to 2.2 pounds. Webmaster note: Thank you for calling that to my attention. I have corrected it. That decimal point makes a big difference, doesn't it? This page displayed 38,393 times.